Nishat Textile Mills are among the few great names in Pakistan’s Textile Industry, produce high quality fabrics and flirt with beautiful designs in glorifying colors. This time the summer collection is in stores quite early. Nishat Linen summer collection 2011 is already in market and this makes them the first brand to launch the summer collection 2011. This very collection speaks a soft, silky language of ‘Satin’ fabric by Nishat, in shades of sophistication and classiness. Styleablaze exclusively takes a peak into the elegant works by Nishat, when accessorized beautifully with an embroidered Pashmina shawl as exemplified by Pakistani model Mahnoor Baloch in this shoot, it is bound to add even more grace to your clothing. These designers benevolently used their peculiar creativity and ingenuity to compile a perfect collection that will make your mornings divine and evenings shine! The team of designers included the talented Sanam Choudhri, Feeha Jamshed, Mahin Hussain, Imbias, and Salman Arif. 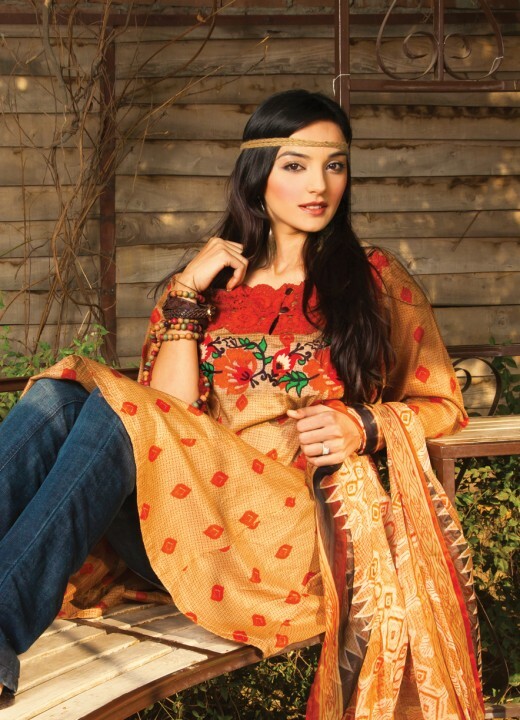 Nishat Spring/Summer Collection for 2011 is out and available. Each year, Nishat’s Nisha Collection commends new designs in newest trends. In 2011, the promise to give the finest and the fanciest has yet again been fulfilled with an exciting surprise!